All the flavor without the filler. Have you ever wanted to play a dungeon crawler but didn't want to take fifty bajillion hours out of your life just to create a character? Indie developer Archebit knows the feeling. 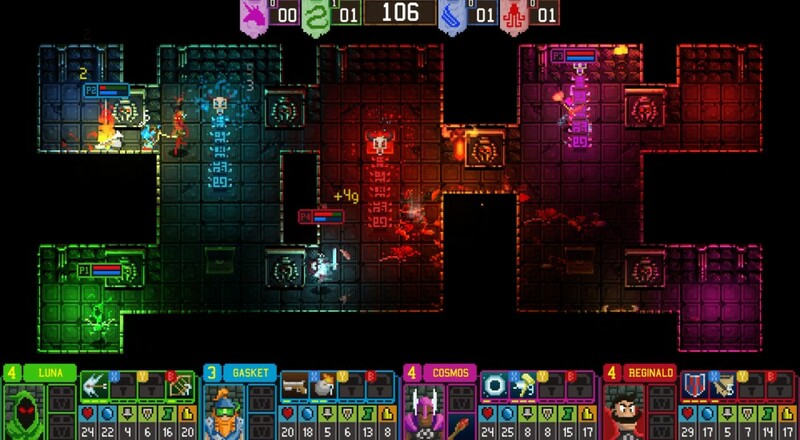 Dungeon League condenses all the fun and excitement of a dungeon crawler into short, bite-sized runs you and a friend can complete in just ten minutes. Who needs epic when you've got intense, right? The Dungeon Masters have grown bored with their lives. Instead of waiting for more adventurers, they decide to turn their world into some sort of crazy blood bowl event. So begins Dungeon League, a series of dungeon crawling events that spew out ten minutes of chaos one game at a time. Teams enter procedurally generated dungeons and battle each other and hordes of enemies from a stack of random quests, then see who can survive. Heroes gain levels, find gear, and grab loot at a rapid pace, staying true to the speed of an RPG that plays out in just a few minutes' time. Dungeon League is a party game at its heart, and it features a lot of competitive games that pit players against each other. True to the co-op spirit, though, are two modes that encourage people to work together. It's not much, but it counts! Gauntlet and Survival modes haven't been added to the Early Access game just yet, however, so we'll have to wait to see what cooperative bounties Dungeon League will unleash. The full release is expected sometime in 2016. Page created in 1.4295 seconds.